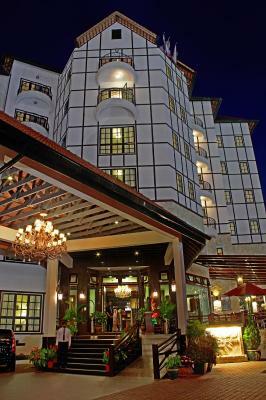 Lock in a great price for Hotel De' La Ferns, Cameron Highlands – rated 8 by recent guests! I loved the breakfast, with many local options but also international ones. The staff was very helpful and friendly. The room was spacious, clean and comfortable. It was close to the nature but also to the weekend night market. I didn't have big expectations and I was pleasantly surprised when we checked in. I didn't pay attention, but my booking included dinner for one of the nights and we were actually given a second - bonus dinner, for the second night. One was Western and the other one was a Steamboat one :) I must say - they both were lavish and delicious! Other than this: -Loved the vintage atmosphere of the property -Staff was extremely kind and helpful - always there when and for whatever we needed. -Breakfast was good enough. -Wifi very good throughout the property. 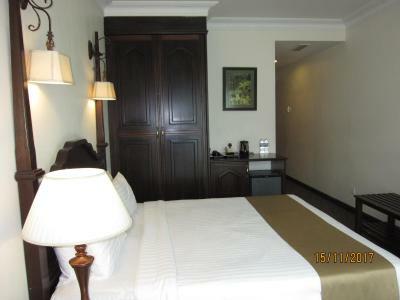 -Rooms were big, clean and toiletries were provided -Location was not bad - walking distance to Tanah Rata. -Beautiful surroundings P.S. If you are travelling by bus to Tanah Rata (as we did), the bus can drop you off on the way - plenty of space to do so! Stayed here for 2 nights and 3days. Overall I am satisfied with the hotel. Love the location, away from bustling town. Carpark is just at the front of the hotel and it felt safe. Rooms are spacious and good. They're doing so great on the cleanliness. Very neat, very decent. The rooms' fabrics are also good. It was absolutely neat..to the details. We can see it. Internet was perfect. Dining meneger mr raju was great He made us feel very welcome and was atentiv to all our wishes If you need something Talk to him Staff very polite and pleasant. The room, the environmental and the steamboat Dinner. 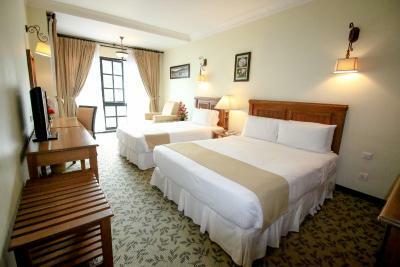 Spacious clean n comfortable room. Nice misty forest view. Food is superb. Should try d steamboat menu, unlike others. 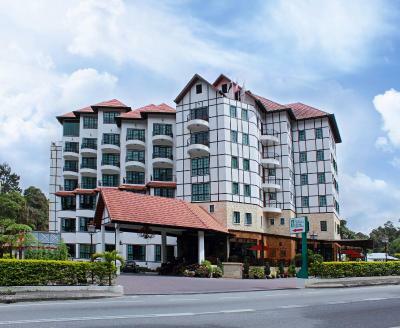 Hotel De' La Ferns, Cameron Highlands This rating is a reflection of how the property compares to the industry standard when it comes to price, facilities and services available. It's based on a self-evaluation by the property. Use this rating to help choose your stay! 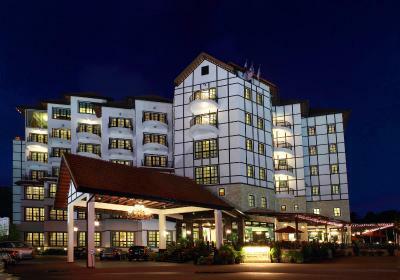 On the cool hills of Cameron Highlands, this hotel features an English Tudor-style architecture and provides a restaurant and free Wi-Fi. Select rooms offer views of the countryside and the golf course. 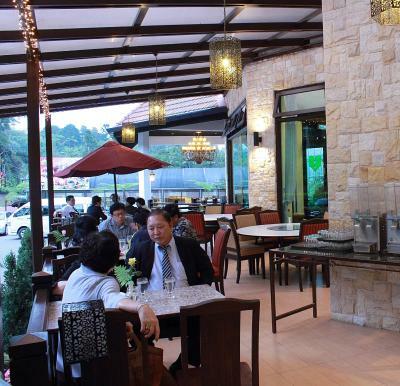 Hotel De’ La Ferns is a 5-minute drive from Tanah Rata and Brin Chang. Rooms at De’ La Ferns Hotel come equipped with satellite TV and a minibar. The private bathroom has a shower and a hairdryer. Room service is provided. De’ La Ferns has a 24-hour front desk that provides services such as fax and photocopying. Those who drive can park on the premises for free. 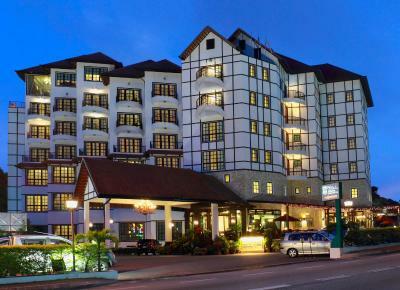 When would you like to stay at Hotel De' La Ferns, Cameron Highlands? Rooms have TV with satellite channels and a mini-bar, and come with country or golf course views. Extra bedding is not allowed in this room type. All special request are subject to availability upon arrival. Located on lower floors, these rooms for 3 come with a satellite TV and a mini-bar. Rooms come with country views. Extra bedding is not allowed in this room type. Located on lower floors, these larger rooms for 4 come with a satellite TV and a mini-bar. Rooms have no balcony. Selected Family Suites feature a private balcony or living area. Suites come with country or golf course views. Junior Suites feature a private balcony with golf course and countryside views. This spacious duplex penthouse suite features a large private bedroom with king-size bed, a living area and a big balcony. Suite offers both golf course and countryside views. Rooms for 2 have TV with satellite channels and a mini-bar. Rooms come with country or golf course views. Package includes daily breakfast and 1 steamboat dinner. Located on lower floors, larger rooms for 4 have TV with satellite channels and a mini-bar. Rooms have no balcony. 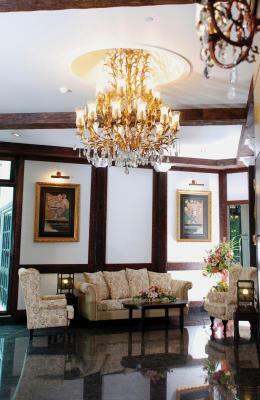 House Rules Hotel De' La Ferns, Cameron Highlands takes special requests – add in the next step! Hotel De&#39; La Ferns, Cameron Highlands accepts these cards and reserves the right to temporarily hold an amount prior to arrival. Hotel De' La Ferns, Cameron Highlands accepts these cards and reserves the right to temporarily hold an amount prior to arrival. Please note that guests have to pay a deposit for incidental charges via cash or credit card pre-authorization upon check-in. Please present the same credit card used to guarantee your booking when checking in at the hotel. For security purposes, credit cards used for Non Refundable bookings must also be presented when checking in. Extra person will be charged per night (with and without breakfast). Lots of flies in the restaurant. Could improve on this. Big and comfortable room. 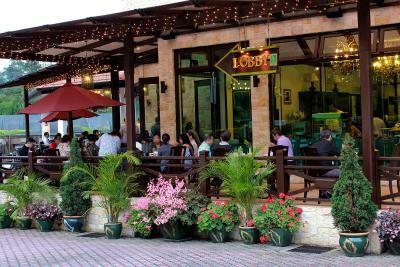 Offers 10% off for dinner at the restaurant for in-house guest. Breakfast is okay. 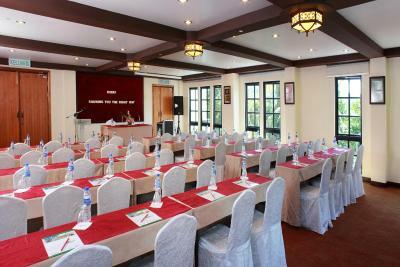 Friendly staff, spacious room, nice ambience.. Spacious rooms, good breakfast, enough parking spaces, nice location away from the main crowd, friendly and very helpful staff. Good value for money. It was on the expensive side. The staff wasnt exceptionally welcoming. Breakfast was hearty. beds were clean and soft. Room clean. location good. The dinner was pretty good. We could have plenty Cameron highland vegetables as much as we wanted. Super great Fried rice was provided with steam boat. And hotel manager's trip advises were very reliable and we could really enjoyed our staying there. Leaking bidet in the bathroom. Clean room and bed sheets. Very friendly staff. The steamboat buffet dinner was really good with big portions. Methods of payment. My card was charged when I prefer paying with cash to avoid international transfer fees. Room facing the main road. Busy and noisy. Location. Breakfast buffet was good. Nice hotel. Nice concept. Variety food during breakfast. Very near to steamboat & snacks hotspot. Will come back again in the future.